This canner is made of hard anodized aluminum, so the pot can be used for cooking a wide variety of foods when it’s not being used as a canner. The lid is made of stainless steel and the handles stay cool during the canning process so you can move it while it’s hot. The steamer insert fits into the stepped section of the pot that’s about 1/3 of the way from the bottom, so you can steam vegetables, tamales, or similar foods. The rack fits into the bottom of the pot, so it keeps jars off the bottom during canning. The rack handles that make it easy to lower the jars into the pot and remove them when canning is done. This 20-quart cooker can hold seven-quart jars or eight-pint jars. It has an adjustable regulator system that can be set to 5, 10, or 15 psi, so you can use it for safely canning non-acidic foods. 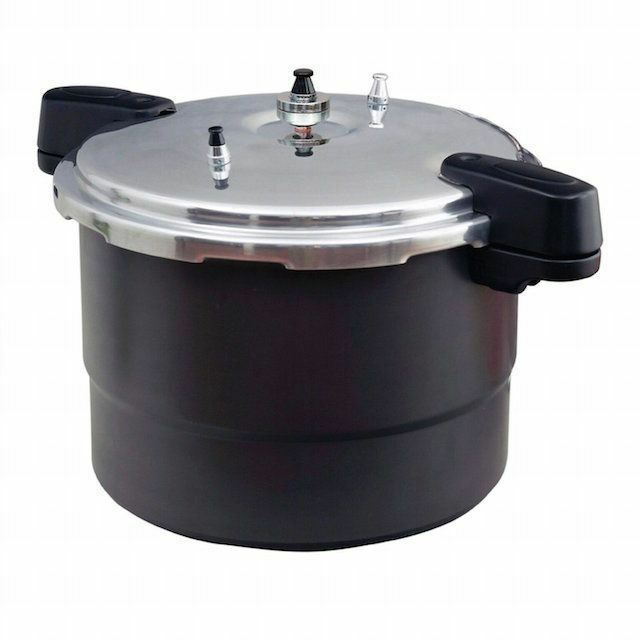 You can also use it as a standard pressure cooker for large batches of food and large cuts of meat. This has a pop-up pressure indicator that also locks the lid in place for safety since it keeps the lid from opening even when a small amount of pressure remains. The steam vent is in the center of the lid, and if it fails, there are two addition safety valves; the second valve whistles to let you know there’s a problem. This is not recommended for glass cooktops. If you’re looking for a canner and don’t care much about using the pot for pressure cooking or stovetop cooking, this budget canner will make your wallet happy. Since it’s made from aluminum, it shouldn’t be used for cooking reactive foods like tomatoes, but it would be fine for non-acidic foods or for steaming. And of course, it’s great for canning, where the liquid is just plain water that doesn’t come in contact with the food you’re cooking. This includes a cooking rack. If you want to occasionally can small batches of soup stock or vegetables, a small, compact 10 1/2 quart canner might make sense. This is only 11 3/4 inches tall, with a 10 1/4-inch inside diameter, so it won’t take as much storage space as a larger canner, yet it holds four quart jars or seven pint jars. This canner is made from cast aluminum with a satin finish so it’s easy to keep clean. Wing nuts on the lid clamp it shut, and there are no gaskets that need replacing, since this has a metal-to-metal sealing system. Because you don’t have to deal with a gasket, the lid is easy to put on and take off. The regulator weight is adjustable for 5-, 10-, or 15 psi. For safety, it has an automatic over-pressure release. While this isn’t intended for pressure canning, it’s worth a mention since it makes water bath canning much easier, particularly for folks who are new to the process. While it’s designed particularly for canning, it can also be used for steaming or to cook soup, pasta, or similar foods. This 21-quart cooker holds eight-pint jars or seven-quart jars, and is intended for canning high-acid foods like tomatoes, pickles, high-acid fruits and jams, and relishes. Since it does not reach high pressure, it should not be used for low-acid foods like soup, broth, meat, fish or non-acidic vegetables. 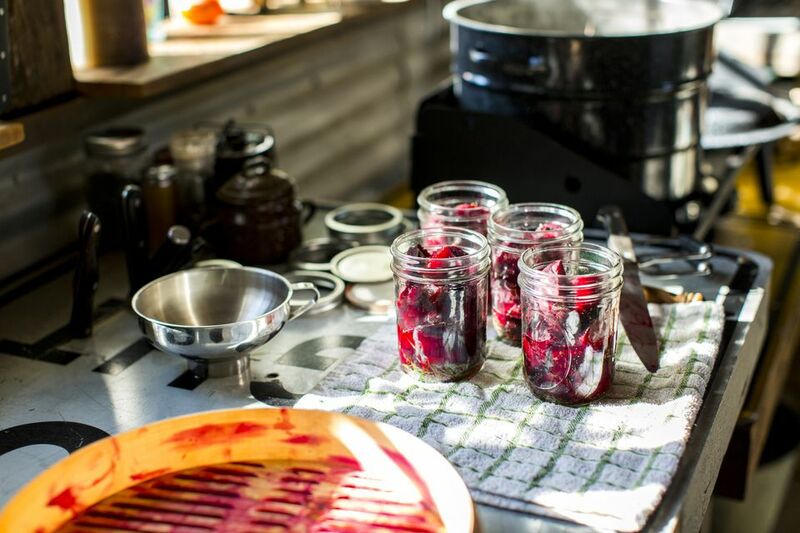 This uses less energy than canning on a typical stove and is great for people who have a glass stovetop that can’t handle the weight of a traditional stovetop pressure canner. A drain spout allows you to drain hot water from the canner without having to move the entire canner full of hot water. If you don’t want to use the spout function, a plug can be used to seal the spout. If your garden is huge or you like to buy in quantity from the farmers market, but you don’t want to spend the time to make multiple batches of canned vegetables, this super-large canner will let you cut your canning time significantly. It holds 19-quart jars or 32-pint jars to get your canning done in no time. This 41 1/2 quart canner is made from cast aluminum with a satin finish. Wing nuts on the lid clamp it shut, and there are no gaskets that need replacing since this has a metal-to-metal sealing system. Because you don’t have to deal with a gasket, the lid is easy to put on and take off. The regulator weight is adjustable for 5, 10, or 15 psi. For safety, it has an automatic over-pressure release. This is a very large pot that is 19 inches high with a 15 1/4 inch inside diameter, and it holds a lot of water, so it will be very heavy when full. If you have a glass cooktop, make sure it can handle the weight. This can be used for pressure cooking, but since it’s made from aluminum, it might not be suitable for acidic foods. It has a satin finish that’s easy to keep clean. This 23-quart pressure canner is large enough to hold 24 half pints, 20 pints, or 7 quarts, and can be used as a boiling water canner as well as a pressure canner. The deluxe dial pressure gauge makes it easy to control the pressure for proper canning, even at high altitudes. This works on gas, electric, or smooth top ranges, but can’t be used on convection cooktops since it is made from aluminum. The air vent and cover lock make sure the pressure can only build when the lid is closed properly and prevents the cover from being removed before pressure is released. This includes a canning rack and an 80-page booklet with full instruction and recipes.